Theater and the arts are not the main attraction here in Ocean Beach. The old movie theater (R.I.P. the Strand) is now home to bikinis, t shirts, and beach gear. Perhaps it may be a surprise to some that a number of OBceans are involved in San Diego’s theater scene — a scene which has drawn award winning Broadway performers and Hollywood celebrities. 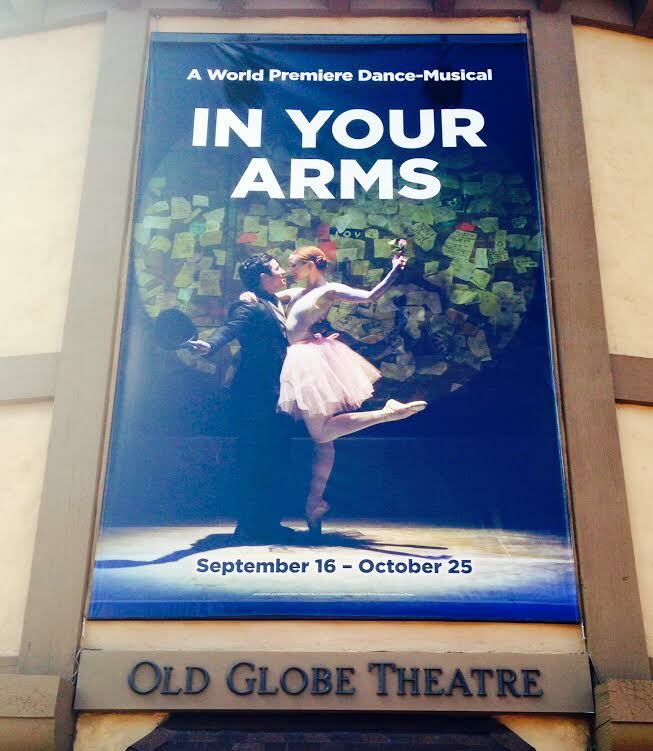 Currently at the Old Globe there is a show that is causing quite a stir in the theater world with a dance musical production which is the first of it’s kind– “In Your Arms.” And there is talk that the show might head to Broadway. This would not be the first time San Diego has been the starting place of a production that has then headed to New York. Home of many top notch productions over the years, the Old Globe has a long history of putting on excellent performances. And “In Your Arms” is no exception. The production is innovative and unique. Ten vignettes approximately 10 minutes each portray a love story, through dance. Some of the vignettes had singing and some had dialogue. And some of the vignettes were just dancing to music. Some of the vignettes were serious and dramatic in nature, and some were comedic. The cast is comprised of talent from all over the world. Many members of the cast have extensive Broadway and Hollywood resumes. And one of the vignettes was written by Carrie Fisher — yes, the same Carrie Fisher who played Princess Leah in Star Wars. Fisher’s vignette showcases her talent for writing as well as comedy, and even features a scene with the classic Princess Leah hair buns. The ten vignettes feature different dance forms. And you can expect to see a little bit of everything. The majority of the vignettes were ballet and modern inspired sequences. A small amount of tap dancing was featured in one vignette. It was a dance tour around the world — with a flamenco number, African dance number, and an Asian influenced number with a kung fu fight scene. Forms of ballroom dance were featured as well — jive, cha cha, tango, pasodoble, and more. It seems nearly every form of dance was featured from around the world. And nearly every social issue and every combination of love was portrayed as well. Heterosexual love. Homosexual love. Interracial love. Racial tensions. Transgender issues. Forbidden love. Young lovers. Old lovers. Lovers separated and then reunited. Even an alien from outer space was featured in one vignette. And various eras from throughout history were portrayed — the 1950s, the roaring 20s, a dreamlike Paris of the early twentieth century. Even the Cold War and Russian and American tensions of the 1960s and 70s were portrayed in one of the vignettes. 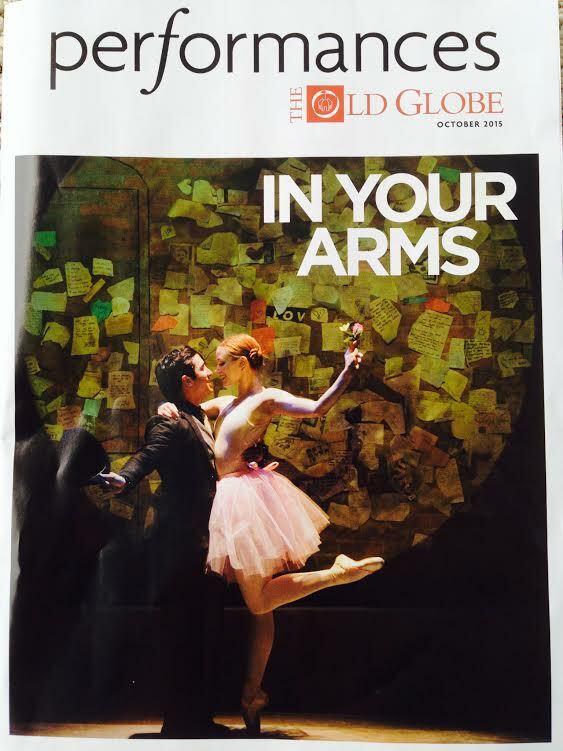 The directors, choreographers, and cast explored every angle of love and every boundary. Every social issue and conflict. Reviewers have described the show as “joyous,” “dazzling,” and “thrilling.” James Herbert of the San Diego Union Tribune described it as, “Stunning, vivid, and exciting.” And all of those words are certainly accurate. Looking at the list of individuals who make donations to the Old Globe, you may see some names you recognize from our beach town. You may also see a name or two you recognize from here in OB, who are employees at the Globe. If you can get your hands on a ticket, pricey though it may be — you will be captivated by an hour and 45 minutes of beauty. The show opened Sept. 16 and will close Oct. 25th. So only a few performances left. And absolutely worth the trip across town, inland to Balboa Park. Great review. Makes me want to get out of this wheel chair and go see it.